Normally this time of day I’d be getting off work and heading to the gym. This is now the third day I haven’t done that and it’s starting to make me feel really unsettled. I’ve done dishes, laundry, run errands, and tried to read a book, but I can’t shake this aching need to be productive. I literally can’t concentrate on anything so there’s no reading, writing (beside this blog), movie watching, or working out that can tame me. I’d cook but we’re leaving to go on vacation tomorrow and already have tons of leftovers that need to be consumed before then. (They’ll probably end up in the freezer). On the bright side, I brushed my teeth and fixed my hair today. I even put on jeans and went to the bank, the library, and Target. I applied for 8 or 9 jobs online and I’m leaving soon to babysit for MOPS (Mothers of Preschoolers) at my church. It’s just $20 every other Thursday but it’s something! Also, my eating was a little more on track today. 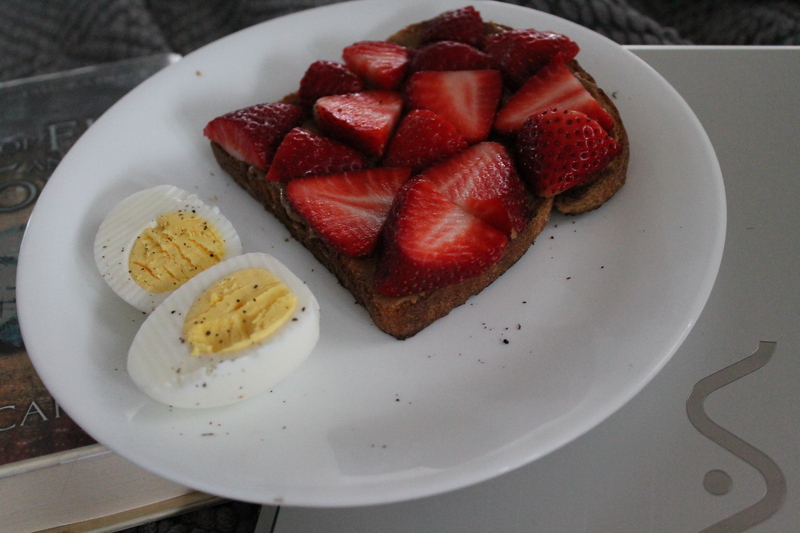 The oatmeal I made last week was looking gross so I had wheat toast with almond butter and strawberries (YUM!) and a hardboiled egg. The eggs turned out PERFECT this time thanks to Ken. Whoever he may be. I am forever indebted! Lunch was some Honey Mustard Pretzel Chicken with streamed broccoli and I had Kashi crackers for a snack. It’s an improvement! What do you do when you’re in between?